Immerse yourself in the language and culture of France and French-speaking nations with BJU’s French program. Take your passion for language to the next level with courses designed to strengthen your conversational French and study abroad opportunities that let you dive into the culture. BJU’s French program focuses on giving you a strong proficiency both in conversation and in writing. As you’re gaining fluency, you’ll also study French history and French literature, giving you a comprehensive picture of French culture. And your professors will incorporate their firsthand knowledge of francophone cultures into your courses. One of the most exciting things about studying French is that it prepares you for a wide variety of vocations. Your courses and opportunities outside of class will prepare you to speak fluently under pressure (this would be at the advanced level, according to ACTFL’s proficiency guidelines for interpersonal communication). Expand your skills beyond French fluency with the BJU Core. 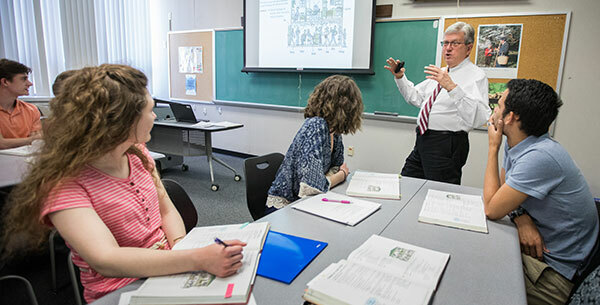 Liberal arts courses introduce philosophy, history and literature through the lens of a biblical worldview. Speech courses will help you develop your communication skills both for one-on-one and public speaking settings. BJU’s Bible courses apply biblical truth to everyday life—preparing you to engage with people from every tongue and nation. You’ll know what you believe about God, why you believe it, and how to share the truth with others. As part of the French program, you’ll choose a second language of study from one of the other languages offered at BJU, including Spanish, German and Chinese. Additionally, you’ll have the opportunity to choose from a variety of electives. Courses such as business and communication are helpful and complement a language degree well, providing knowledge and skills that you can use in almost every industry. And courses in technology, psychology and the arts are great choices if you’re planning on using French in those fields. The program’s flexibility gives you options that will help you meet your career goals. In addition, over 60 businesses and 150 Christian schools, mission boards and other Christian organizations come on campus to recruit students through on-campus interviews and job/ministry fairs. Practical experience, especially in a language, is essential. That is why BJU’s French faculty encourage your involvement with native speakers, both at BJU and abroad. These opportunities will help you better understand spoken French and in turn help you better communicate with others. The University Language Association is a student-run organization that brings in speakers from various countries and occupations to give you opportunities to see the connections between language and future careers. You’ll also learn about needs in Christian ministries around the world so you can give of yourself through prayer and other means for the glory of God. A summer of study abroad enhances your degree with an immersive experience in French language and culture. You’ll choose from premier language universities in Quebec or France and spend a summer taking coursework with professors and fellow students who speak French as a first language. Language halls give residence hall students the chance to live near other students studying languages so that you have extra opportunities to practice conversing and improving your language skills. Your French faculty are both knowledgeable and enthusiastic about their subject. All have traveled extensively in French-speaking countries, so they teach from their firsthand experience of cultures and dialects. Communicate in French at the Advanced level in the interpersonalmode. Communicate in French at the Advanced level in the presentational mode. Understand French at the Advanced level in the interpretive mode. Evaluate francophone cultures from a biblical worldview.